‘Tis the season for e-mail appeals and Santa-costume-clad bell-ringers outside every mall and grocery store. Inform your year-end giving with these fast facts from the Urban Institute’s Center on Nonprofits and Philanthropy. 1. Individual giving is on the rise, though it’s still not at pre-recession levels. Individual giving peaked in 2005 and stayed relatively level until it took a dip in 2008. 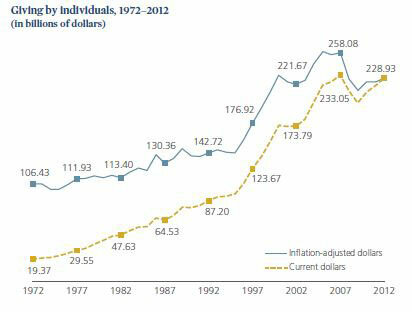 Donations dropped again in 2009, but every year since then has seen a gradual increase, reports Giving USA. 2. 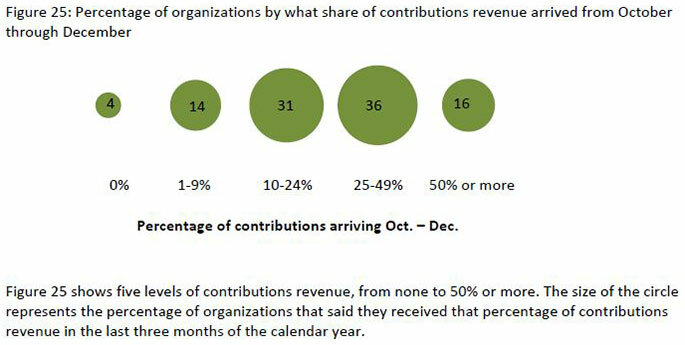 Yes, Virginia, there is a “giving season.” Over half of surveyed nonprofits told GuideStar that they receive most of their donations between October and December. Meanwhile, a 2007 study from The Center of Philanthropy at Indiana University found that respondents reported giving about 24 percent of their annual total between Thanksgiving and New Year’s Day. 3. The more—or less—you make, the more you give. IRS data reveal an interesting trend: those at either the high end or low end of the income distribution tend to give a higher percentage of their income than those in the middle. 4. Individual donations make a big impact. 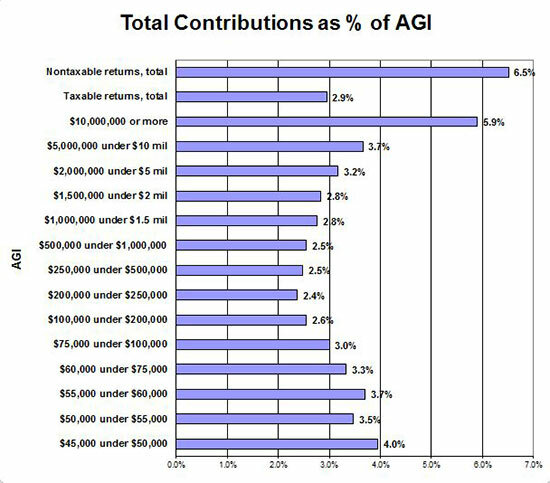 In 2012, individual contributions accounted for 72 percent of all contributions. That year, individual gifts totaled $228.93 billion, an increase of 3.9 percent in current dollars (adjusted for inflation, a still-impressive 1.9 percent) from 2011. 6. Those who donate to religious organizations give more overall. Though fewer households make charitable donations of $25 or more to religious organizations than to non-religious ones, those who contribute to religious organizations tend to give more overall, both in dollars per donation and in percent of income donated.